Good news: after supporting fast charging on the iPhone for quite a while now, Apple finally sells an 18W wall adapter so you can make use of it! Bad news: it costs a whopping $29 on Apple’s website! That’s a tall order for a wall adapter, especially when you have no choice but to also buy a $19 USB-C to Lightning cable in order to use it. Don’t worry though, because we’re about to save you some cash. 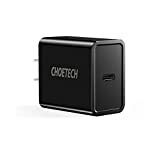 Pick up a CHOETECH 18W USB C Charger on Amazon instead, and you’ll pay less than $17 rather than $29. 18W power delivery: The USB Type-C charger delivers up to 18W of power with USB power Delivery (PD) specification for charging your devices. Safe charging: Internal sophisticated circuit design with reliable multiple protections against over-current, over-voltage, overheating and short circuit. Compatibility: charge nearly all USB-C enabled devices, but we recommends pairing it with USB-C phones that support Pd function for optimal charging performance.